It’s hard to argue with the difference. And Wade’s return has the Wildcats right back into the Big 12 race. Iowa State probably doesn’t want to toggle between two-game winning streaks and two-game losing streaks. But the Cyclones picked a great time to toggle back to the winning side, beating Texas Tech on the road on Wednesday night and then beating an undermanned Oklahoma State team at home on Saturday. The better news is that Lindell Wigginton and Cameron Lard are further integrating themselves into the team off the bench, a factor that makes this team that much stronger when it comes to competing in the Big 12. The best news? They’re tied for the lead in the league after six games, thanks to another Tech loss and a Kansas loss in West Virginia. These young Cyclones made it clear this week that they’re in this to be a factor and not just a spoiler. I was at West Virginia’s awful loss to TCU (see the Ugly portion of this article). But let’s be positive, because, after all this is the “good” portion of this article. 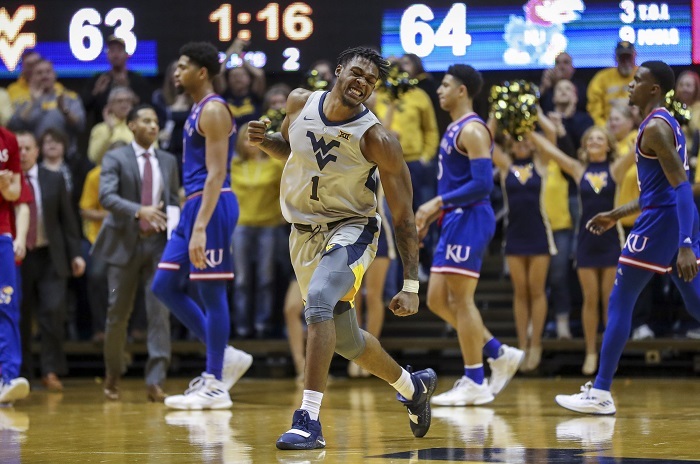 Four days after head coach Bob Huggins looked as broken as any coach I’ve ever seen after a loss, his Mountaineers pulled off a massive upset for their first Big 12 win, beating Kansas at home. It will probably be the Mountaineers’ biggest win in a season that just a few days ago looked completely lost. Good for them. 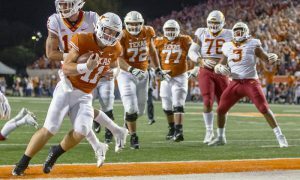 The Longhorns were edging precipitously close to going off the rails having lost three straight games. They had chances to beat Kansas at Allen Fieldhouse on Monday, including a potential Jase Febres game-winner. 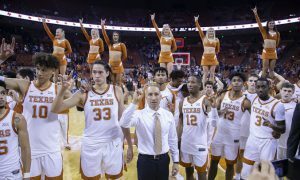 But coming back home to Austin for Saturday’s game, the Longhorns had five days to stew about that loss, along with their three-game losing streak. Well, Kerwin Roach III and Jaxson Hayes wouldn’t let them. 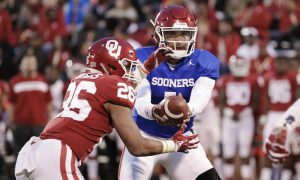 By beating Oklahoma, their hated rival, they flipped the switch back to being a .500 team in league play, found some momentum going into a beatable TCU team on the road and might just be on a potential turnaround. Hayes is starting to become an offensive force inside, and coupled with his shot-blocking he’s giving the Longhorns a presence they didn’t have a month ago. This is the kind of win the Longhorns needed to build some consistency. The question is, will they? Texas actually named Matthew McConaughey its minister of culture for its new arena, set to open in 2021. Wearing that suit should be required. When Tristan Clark went down, I was wondering who would shoulder the load for the Baylor Bears. Well, at least this past week, it was guard King McClure. Against Oklahoma State he scored 25 points. Then, against Texas Tech he scored only 8 points, but he was an important part of that Bears win over Tech anyway, with 6 rebounds, 4 assists and 4 steals. So his impact on that victory couldn’t quite be measured by points. Clark’s week helped the Bears win both games and get back over .500. This, plus the rise of freshman guard Jared Butler, has me a bit more bullish on the Bears than I was a few weeks ago. Texas Tech was riding high going into the start of this week. By the end of it the Red Raiders lost games and fell back into a first-place tie in the Big 12. What happened? Well, the Big 12 happened. Perhaps the toughest conference in college basketball reared its ugly head and rained on Tech’s parade. The loss at home to Iowa State is excusable. We all knew Tech wasn’t going to run the table. The Cyclones were highly motivated to end their two-game losing streak and, aside from Tech’s horrid game at the free-throw line, they were Iowa State’s equal. The Baylor loss is the one I can’t quite figure out. Baylor is undermanned with the loss of Tristan Clark and that should have allowed the Red Raiders to dominate inside. But that really didn’t happen. In fact, Baylor outrebounded the Red Raiders by two. If Tech lost the game to Baylor any reason it was their own mistakes. 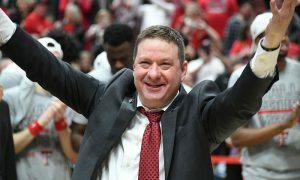 The Red Raiders committed 17 turnovers, which negated their own fine shooting and a bounce-back game at the free-throw line (nearly 80 percent). It’s what makes the conference so great to watch and so frustrating for a team like Tech, which can win this league. There is little margin for error. Just ask Kansas. I’m getting the sense that Kansas may not quite be the team we thought they were. I’m not saying their streak of Big 12 regular season titles is going to come to an end this season. But I felt going into this season the Jayhawks would be deeper and more talented than last year, and I think most around the country had that sense, too. But Saturday’s loss to West Virginia has questioning that logic. I don’t think head coach Bill Self has solved his bench issue in the wake of Udoka Azubuike’s injury. He played his starters 30 or more minutes each against the Mountaineers. The only bench player who logged double-digit minute was guard K.J. Lawson (16). The bench produced four points. Self did something similar against Texas, though two of his starters did log slightly 30 minutes. If the production from his bench is going to be that limited, then Kansas is in for a tougher road to defending its Big 12 crown. Right now I think Texas Tech and Iowa State are deeper than the Jayhawks. That could certainly change as his bench gets more playing time. But in tight games like this past week, how much trust will Self put in that bench? It’s something to monitor. I covered the West Virginia-TCU game on Tuesday night in Fort Worth, Texas. It did not go well for the Mountaineers, who lost that contest, 98-67. After the game the media talked with head coach Bob Huggins. I’ve covered Super Bowls and national championship games. I’m not sure I’ve seen a coach more broken by his team’s performance than Huggins that night. The video is below, first the two snippets that I broke out and then the full video. I’m not sure things get any better in West Virginia this season. Well, of course, you know they did — at least for one day. But long-term this team is still in trouble. Somehow these same Mountaineers beat Kansas at home? The mind reels. 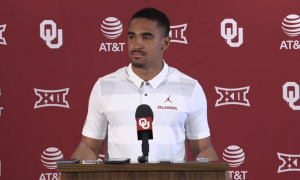 Oklahoma State head coach Mike Boynton Jr. dismissed three of his players on Wednesday — Michael Weathers, Maurice Calloo and Kentrevious Jones. With those dismissals the Cowboys had eight scholarship players and nine players total on their roster, prompting head coach Mike Boynton Jr. to hold open walk-on tryouts on Thursday. Per the Tulsa World, none of the 47 participants made the team, but some could be called upon to be practice players. So, at best, it appears Oklahoma State will ride with nine players the rest of the season. The loss to depth was clear in their loss to Iowa State on Saturday, and it will probably become more apparent during the rest of the season. This season has the potential to get plain ugly for Boynton, who turned 37 on — you guessed it — walk-on tryout night. 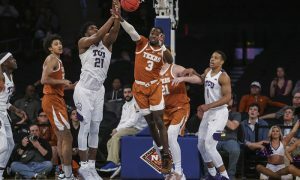 The Horned Frogs announced that their junior guard, who has fought injuries his entire time in Fort Worth, would not return this season and had put his name in the transfer portal. 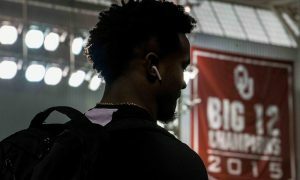 Now, he may not league and TCU has told him they will honor his scholarship should he choose to stay and not play. But it leaves the Horned Frogs even more short-handed than they already were. TCU now has four players in the transfer portal, three of which are out for the season due to injury. So head coach Jamie Dixon burned the redshirt of center Reggie Barlow on Saturday against Kansas State, which turned into a loss. Fisher was, when he was recruited, the program’s highest-rated recruit ever. It’s a shame his body wouldn’t cooperate, because when he was healthy he was one of the team’s most electrifying players. Iowa State at Kansas, 8 p.m.
Baylor at West Virginia, 8 p.m.
Texas Tech at Kansas State, 6 p.m.
Texas at TCU, 6 p.m.
Oklahoma at Oklahoma State, 8 p.m.
Florida at TCU, 11 a.m.
Alabama at Baylor, 11 a.m.
Iowa State at Ole Miss, 11 a.m.
Kansas State at Texas A&M, 1 p.m.
South Carolina at Oklahoma State, 1 p.m.
Vanderbilt at Oklahoma, 3 p.m.
Arkansas at Texas Tech, 5 p.m.
20-point games: Desmond Bane, TCU, 26 (vs. West Virginia, Jan. 15); Barry Brown Jr., Kansas State, 25 (vs. Oklahoma, Jan. 16); Jarrett Culver, Texas Tech, 20 (vs. Iowa State, Jan. 16); Myles Garrett, Kansas, 20 (vs. Texas, Jan. 14); Christian James, Oklahoma, 20 (vs. Kansas State, Jan. 16), 20 (vs. Texas, Jan. 19); Dedric Lawson, Kansas, 11 (vs. West Virginia, Jan. 19); King McClure, Baylor, 29 (vs. Oklahoma State, Jan. 14); Kerwin Roach III, Texas, 23 (vs. Oklahoma, Jan. 19); Marial Shayok, Iowa State, 20 (vs. Texas Tech, Jan. 16), 20 (vs. Oklahoma State, Jan. 19); Lagerald Vick, Kansas, 21 (vs. Texas, Jan. 14); Dean Wade, Kansas State, 20 (vs. Oklahoma, Jan. 16). 10-rebound games: Yor Anei, Oklahoma State, 12 (vs. Iowa State, Jan. 19); Jarrett Culver, Texas Tech, 16 (vs. Iowa State, Jan. 16); Michael Jacobson, Iowa State, 14 (vs. Texas Tech, Jan. 16); Cameron McGriff, Oklahoma State, 10 (vs. Baylor, Jan. 14); J.D. Miller, TCU, 5 (vs. West Virginia, Jan. 15); Dylan Osetkowski, Texas, 11 (vs. Oklahoma, Jan. 19); Alex Robinson, TCU, 10 (vs. West Virginia, Jan. 15); Mark Vital, Baylor, 13 (vs. Oklahoma State, Jan. 14). 5-assist games: Barry Brown Jr., Kansas State, 5 (vs. Oklahoma, Jan. 16); Jared Butler, Baylor, 5 (vs. Texas Tech, Jan. 19); Matt Coleman III, Texas, 8 (vs. Kansas, Jan. 14); Jarrett Culver, Texas Tech, 5 (vs. Baylor, Jan. 19); Devon Dotson, Kansas, 5 (vs. Texas, Jan. 14); Jermaine Haley, West Virginia, 5 (vs. TCU, Jan. 15); Tyrese Halliburton, Iowa State, 6 (vs. Texas Tech, Jan. 16); Isaac Likekele, Oklahoma State, 5 (vs. Baylor, Jan. 14); Mark Vital, Baylor, 5 (vs. Oklahoma State, Jan. 14); Dean Wade, Kansas State, 6 (vs. TCU, Jan. 19). 4-block games: Jaxson Hayes, Texas, 5 (vs. Oklahoma, Jan. 19). 4-steal games: James Bolden, West Virginia, 4 (vs. Kansas, Jan. 19); Myles Garrett, Kansas, 6 (vs. West Virginia, Jan. 19); King McClure, Baylor, 4 (vs. Texas Tech, Jan. 19). 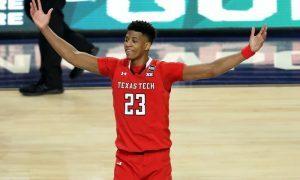 Double-doubles: Jarrett Culver, Texas Tech, 20 points, 16 rebounds (vs. Iowa State, Jan. 16); Michael Jacobson, Iowa State, 14 points, 10 rebounds (vs. Texas Tech, Jan. 16); Dedric Lawson, Kansas, 15 points, 11 rebounds (vs. West Virginia, Jan. 19); Cameron McGriff, Oklahoma State, 15 points, 10 rebounds (vs. Baylor, Jan. 14).